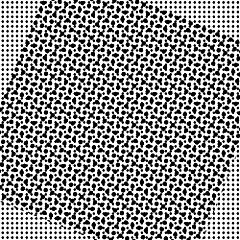 Many mangas use so-called screentones - geometric patterns used as background and to distinguish between different "colors", since mangas are generally printed in black and white. Traditionally, screentones were bought for a lot of money and then carefully applied to the lineart. 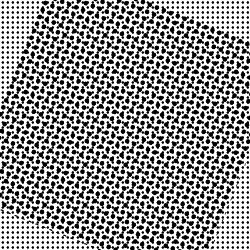 Fortunetely, these days it is possible to easily create your own screentones digitally, and this tutorial explains how. Note: This tutorial was written for GIMP, but it should easily work with similar graphics programs. First, create a new image with the standard white background. This should be a fairly large image - large enough for your needs, anyway. Create a new layer and set the layer mode to "Multiply". Fill it with a light gray. Now apply the Newsprint filter to it. Toy around with the various options, but set all the color channels to the same angles. 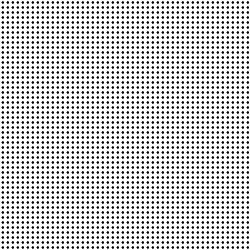 Now you should have a layer filled with small black dots. Repeat this process with another layer, but feel free to use a different grey and different settings for the filter. Now rotate the layer with an arbitrary angle, and you should have a nice pattern suitable as a screentone - though the pattern won't extend beyond the areas where the two layers overlap. Just cut out the part you need and discard the rest. 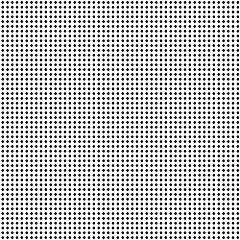 If you intend it for online use, you might need to shrink the image (like I did). Feel free to experiment with this process as much as you want - and adding additional layers with more patterns can likewise create interesting results.